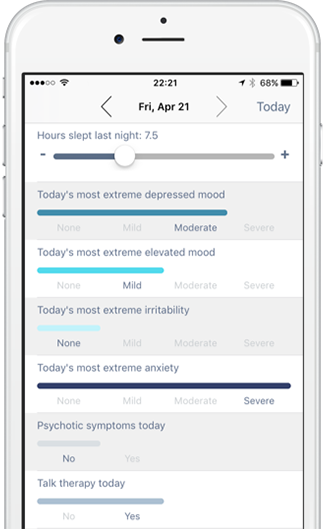 Track your mood and other symptoms effortlessly in seconds. eMoods is a free Mood Tracker app that lets you easily chart your daily highs and lows, sleep, medications, and other symptoms related to common mood disorders. Send printable reports to your doctor and receive valuable insights about your triggers and mood patterns. Which eMoods app is right for you? eMoods Reporting lets you log your data completely offline, and print a monthly chart to show your doctor. There is no login and data is stored only on your device. eMoods Insights lets you sync your data between devices and gives you rich charts and insights into your data. A login is required, but your data remains yours and yours alone- Your privacy is paramount. eMoods is a free Mood Tracker app that lets you easily chart your daily highs and lows, sleep, medications, and other symptoms related to Bipolar and other common mood disorders. The app allows you to send a printable PDF report to your doctor or therapist at the end of each month to help identify patterns, triggers, and other events relevant to your treatment plan. eMoods Reporting is an offline tool for mood logging and sending reports to your doctor. None of your data is stored online. 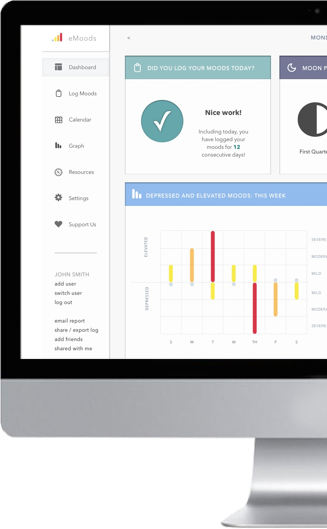 eMoods Insights is a web-based tool for more advanced mood logging and reporting, and provides rich insights into your data via advanced graphs and charts. It stores your data in the cloud and syncs between all of your devices. This app does not provide medical advice or treatment and should only be used under the supervision of a licensed professional. IF YOU ARE EXPERIENCING ANY KIND OF EMERGENCY, DIAL 911 IMMEDIATELY, OR CALL THE NATIONAL SUICIDE PREVENTION LIFELINE IN THE UNITED STATES AT 1-800-273-8255. If you are outside of the US, find a list of hotlines in your country here.